Rob and Nancy loved living in a yurt on their verdant property in Maine, but longed for additional bedroom space. The couple asked Pete for an arboreal bedroom retreat, complete with an ample deck, copper roofing, and lots of windows. 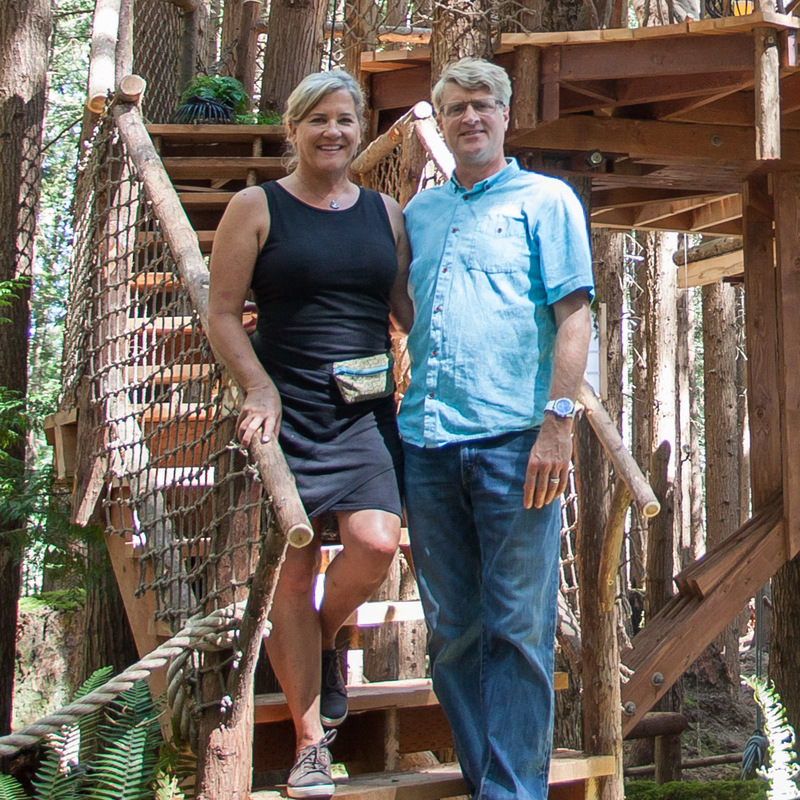 As luck would have it, Pete's sister, Molly, is a neighbor of Rob and Nancy's - Pete was delighted to visit Molly and build Rob and Nancy a posh treehouse bedroom! Rob and Nancy's treehouse roosts 19 feet high in four hemlock trees and two white pines. Features like the retractable window wall, copper roof, high ceilings, and crow’s nest add an artful touch. A 150-foot elevated walkway winds through the trees from Rob and Nancy's yurt porch to the treehouse deck. Warm-hued western red cedar board and batten siding covers the exterior. A 12-foot, handcrafted ship's ladder leads from the deck to the rooftop crow's nest. The first-floor deck offers sweeping views of the forest in all its fall splendor. Pete enjoying the vistas from the curved deck. The view of the surrounding hills from the roof-top crow's nest is breathtaking. The copper roof adds glamour to this treehouse bedroom retreat. A small mudroom precedes the bedroom. The floor features locally sourced river rock. A high-efficiency wood-burning stove keeps the inside warm. Locally milled white pine panels the interior walls. The bedroom features an 11-by-9-foot retractable window wall that connects the interior directly to the outdoors. The frame for the window wall is made of 6061 TS aluminum, which is lighter and stronger than steel. This material does not rust and the color never chips - it'll last a lifetime up in the trees! Twelve-foot-high ceilings make the bedroom feel ultra-spacious. This treehouse is made even more elegant with a bed frame and lounge chairs crafted by the renowned furniture-maker Thomas Moser. The crew added a slab countertop with a sink basin. This treehouse almost looks as though it's floating in the trees! We hope you’ve enjoyed taking a look at our Hemlock Hideaway. Let us know your favorite feature, in the comments below! You can take our photo tours of treehouses from each season of Treehouse Masters, here.